Instant Imprints Coquitlam, BC | Custom T-Shirts, Embroidery, Signs and More! At Instant Imprints in Coquitlam, our customers come to us when they want to be more visible to their customers. We create that visibility five different ways: Branded Apparel (embroidery), Signs & Banners, Promotional Products, Custom T-Shirts and Print Services. Across BC, businesses are looking for ways to represent their brands with style and professionalism. Whether you’re promoting an event or hyping a new service or product, Instant Imprints here in Coquitlam can bring you the promotional materials to bring your brand visibility to the next level. If you’re looking for custom t-shirts, printing services, promotional products, custom banners or branded embroidery items, Instant Imprints provides a world-class service combined with the local touch that Coquitlam is known for. Stop by our Pinetree Way showroom start down your path to a more visible business! Are you looking to bring your brand vision to more people, whether it be on the motorways, the sidewalks or their shirts? Well look no further than Instant Imprints Coquitlam, one of BC’s best print shops. We strive to get your job done right the first time, and delivered when you need it… or early. Our professional print shop gives you a level of quality that you won’t find with office or home printing solutions. No matter what you’re looking to brand, let Instant Imprints in Coquitlam lead the way! The power of custom t-shirts is well known, across Canada and the globe. Virtually every global brand has a custom tee of their own. When you want to take your business to the global level, custom t-shirts are a great way for customers to bring your brand with them wherever they go. Just ask Siri, Alexa, or your Assistant, “where can I find custom t-shirts near me?” In addition, our custom embroidery service gives you the power to present your promotional items in personalized ways, or put your customers on a first-name basis with your staff. Customize unique promotional products to keep your brand involved in the daily lives of your prospects! 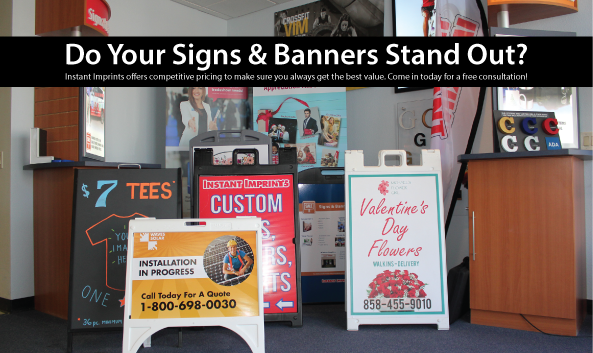 Signs and banners are one of the most effective ways of bringing your brand to the public. From large banners destined for the motorway to portable trade show banners, Instant Imprints here in Coquitlam can take care of all of your custom signs and banner needs. Use sidewalk signs to invite passersby into your storefront, or decorate the side of a building with your logo. Our Coquitlam Image Experts can help you design the perfect sign, no matter the application! Stop by our Pinetree Way storefront, give us a call at (604) 469-5791 or request a quote online to start taking your brand to the next level! Instant Imprints is Coquitlam’s premier source for branded professional items of all kinds.